Roswell C. Smith, founder of the Century Company and Century Magazine, gave the lion's share of the funds to construct this third major Berea campus building. Smith requested the building be named for President Abraham Lincoln (Smith had been one of the distinguished guests at the 1885 commencement exercises). Over a period of seven years (1883-1889) he gave the school a total of $30,100. 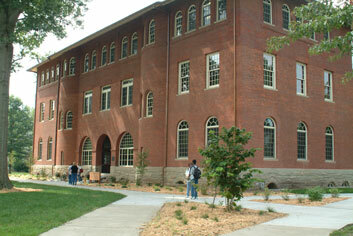 S. A. Warren, W. O. Grover and Cassius M. Clay also provided funds fo r the construction of Lincoln Hall. On September 15, 1885, Berea's Board of Trustees voted to build this "recitation" building and the Prudential Committee, under the leadership of President Fairchild, debated the plans and specifications that cost $1,000. They modified the plans and sought approval from the architects for the changes. Professor Le Vant Dodge suggested "the building have a mansard roof for more space and finer appearances and that a porch project so as to be more inviting and less clumsy" (PCM, September 15, 1885). His suggestions were not accepted. During the winter of 1885, and spring of 1886, the foundation footings were dug by College boys one hundred-sixty fe et fr om Chestnut Street at a cost of $325; the stone came from beds of sandstone two and a half miles southeast of Berea toward Indian Fort; 581,000 bricks were ordered during July, 1885, and were manufactured and burnt on the edge of campus "back of the Tabernacle" during September of that year. The carpentry contract was the largest single expense at $14,450 (Board of Trustees' Report Folder, 1886). Building construction began in March, 1886, and the completed building was dedicated on the Tuesday before Commencement activities, May 13, 1887. In 1886, the American Federation of Labor was formed for members in the skilled crafts; but it would be under the Frost administration and at the beginning of the twentieth century that all Berea College students would be required to work for the College and assist in the cost of their education. However, building after building on the Campus would be in part built by student labor. Babb, Cook and Willard were the designers of the Andrew Carnegie mansion in New York City, an Italian Renaissance Beaux Arts design (today the mansion houses the Cooper-Hewitt Museum). However, the style of Lincoln Hall more closely resembles classroom buildings on the campus of Harvard, especially the plain oblong hip-roofed Sever Hall that was companion to the other red brick buildings of Harvard Yard. The round arched entrance and the two rounded projecting stairwells are signature characteristics of the architect, Henry Hobson Richardson. However, Lincoln Hall does not incorporate the cut brick, floral patterns and polychrome brick and stone work characteristic of Richardson and his associates McKim, Meade and White. Instead, Lincoln Hall is a plain country cousin in comparison to Richardson, yet this building must be considered the finest nineteenth century structure on the Berea College Campus. The red brick building is in keeping with commercial architecture and especially with Smith's Century Company's brick press building in New York's lower Manhattan. Upon Lincoln Hall's completion the older timber and clapboarded Recitation Hall was put up for sale at public auction (Board of Trustees' Report Folder, July 1887). This earlier Recitation Hall stood in a grove of trees alongside Chestnut Street southeast and in front of Lincoln Hall. President Fairchild wrote W. E. Barton (Board Member, Chicago, donor of the College water system): "Lincoln Hall is a great comfort and improves our looks wonderfully . ... Eugene's house (President Fairchild's son and a faculty member) built partly of the old Recitation Hall is full of boarders" (Fairchild correspondence, November 21, 1887). The Berea Evangelist told the story' this way: "Old Recitation Hall has been sold to E. P. Fairchild who has torn it down and moved it on to the east end of his lot adjoining P. D. Dodge" (that lot is the present site of Union Church). 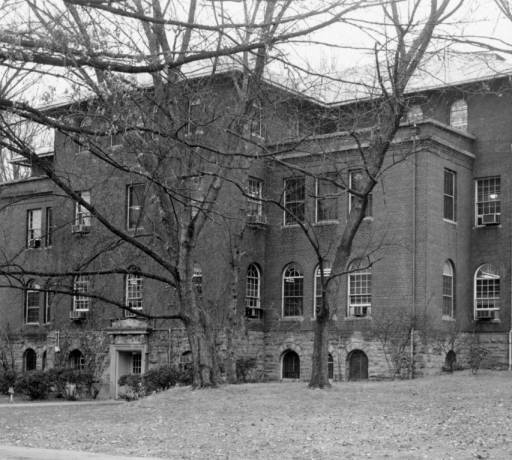 When Lincoln Hall was completed, Berea had an enrollment of 430 students, about half of whom were African American Students. President Fairchild retired in 1889, two years after the building's completion. The bas-relief of Lincoln that was once just inside the front door (today it hangs in Archives) was sculpted by the New York sculptor J. S. Hartley and was paid for by Roswell Smith. A small landscape painting was given to the college sometime at the turn of the century by Roswell Smith's daughter, Julia, who was the wife of George Inness, Jr., the son of the noted American landscape painter George Inness, Sr. Mrs. Inness later gave the College funds ($4,000) to replace the heating system of Lincoln Hall (BTM, Time 5,1907). A bronze portrait bust of Roswell Smith, also by Hartley and given by Mrs. Inness in 1933, stood in the west stairwell for years (today it sits in the main conference room on the second floor). 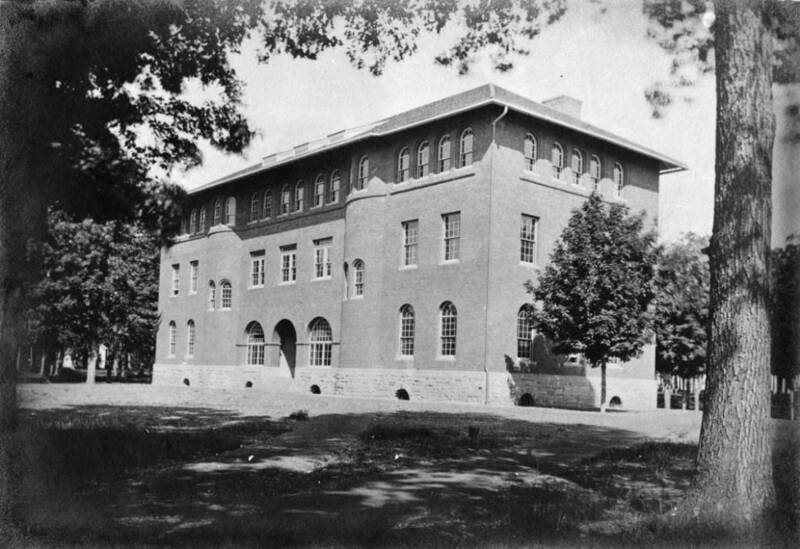 Lincoln Hall became the campus administration building when the executive offices were moved from the Carnegie Library and installed on the second floor in September, 1914 (Frost Diary). A campus post office was set up in the basement in 1915 (President's Annual Report, June 1915). Homespun Craft Fairs were held in the building during commencement exercises from 1896-1916. Frost and the Olmsted Associates agreed to build a roadway behind Lincoln Hall that would connect Main Chapel, the Library and College Street, and constitute a "backdoor" service road. It would be wide enough so that "more dignified fronts could be arranged later looking toward the north" (Memorandum from Frost to Olmsted, September 1, 1914). Major renovations and additions to Lincoln Hall occurred during the Presidency of William J. Hutchins in 1932, forty-five years after its original construction. Fire-proof vaults were built, the main floors were laid with terrazzo, additional three-story office extensions were constructed at the back of the building using a slightly different colored brick, a sprinkler system was added, a new basement back-entrance was constructed, heavy stone stairs to the ground floor were constructed and white Doric iron supporting columns graced the main entrance lobby. Spaces were reassigned and uses changed. These plans, specifications and major construction were developed and carried out by A. O. Elzner and Anderson of Cincinnati (WJ Hutchins' letters, 1931; Berea Citizen, June, 23, 1932, 1; and September 8, 1932, 1; PAR, June, 1933). Because the building was of fine architectural character and was representative of Berea's historic interest in Black education and education combined with self help/work study, members of the faculty and administration requested (1972) that the United States Department of the Interior place the building on the list of National Historic Landmarks. Lincoln Hall was added to that list during February, 1975, with a public ceremony which took place on May 3, 1979 (Berea Citizen, February 20, 1975) Such a Landmark listing limits what can or can not be done to the historic exterior of a building. During a much needed remodeling job by Congleton- Hacker of Lexington, on May 25, 2001, just hours before commencement exercises, the central interior section of Lincoln Hall collapsed when the building's original supporting walls were compromised and breached. After an extended period of investigation and due consideration over the summer months, the Board of Trustees and Administrative Committee decided during October, 2001, to pay for a full remodeling and renovation that would be more physically and ecologically sound. However, construction would take a longer period of time to complete than originally proposed. In the interim, Offices of the President moved to Edwards Building, the Dean, Provost and General Studies Dean moved to the Alumni Building, Student and Academic Services and the Registrar moved to the Appalachian Museum Building, the Business and Treasurer's Office moved to the Trades Building, and Institutional Research moved to the Boone Tavern Annex on Short Street. At the same time as this collapse, renovations had begun on Draper, Talcott and Kentucky residence Halls, Presser Music building and a new addition was begun to the Art Buildings, the Dimitrie Berea Gallery. Over ninety faculty, administrators and classes were relocated in temporary spaces during this costly two-year campus-wide construction campaign. promotion of integrated whole-building design practices and a raised consumer awareness of green building practices (Berea Citizen, Nov. 18, 2004). The original basement floor of Lincoln Hall was lowered·to create higher ceilings and more space for building utilities; the original floors were crushed and used to improve drainage along the foundation walls. The slate-Iook-alike tiles on the roof were made of recycled plastic. Large sections of the origial hardwood floors were taken up and refinished, then replaced. The new heating and cooling system will sense when it needs to be activated, and will advise the occupants when the system needs to be shut down or started, and when windows can be opened or closed. A three- story window-well atrium was cut through the heart of the building to illuminate the core with diffused natural light. This renovation project cost over five and a half million dollars and the building was not occupied until mid August, 2003. The worse case scenario had projected occupancy during January, 2003. As of publication, the newly renovated building now houses Accounts Payable, Purchasing and Accounting in the former basement. Housed on the first floor, so as to make it convenient and "one-stop shopping" for students is the Financial Aid Office, Academic Services and the Student Service Center. The President's Office, Finance and Business and Administration offices are on the second floor; and the offices of the Provost, Dean of the Faculty, Assistant Dean of the Faculty and Institutional Research occupy the top floor. All four floors are serviced by a new elevator and illuminated by the new central light and air-well. The original pair of wooden side stairs was saved but restored. Citation: Boyce, Robert Piper. Building A College: An Architectural History of Berea College. Self-published. Berea, Ky: Berea College Printing Services, 2006, p107-110. NOTE: This content is reproduced here with permission of the author and is COPYRIGHT PROTECTED. Fair Use access granted for educational purposes only, therefore, this content may be used in the classroom or classroom assignments without prior permission as long as proper citation is provided. For commercial use, publication, or reproduction, permission must be obtained from copyright holder or owner. Boyce, Robert Piper. Building A College: An Architectural History of Berea College. Self-published. Berea, Ky: Berea College Printing Services, 2006, p107-110. Lincoln Hall. Digital image. Berea.edu. Berea College n.d. Web. 3 September 2015. <https://www.berea.edu/campus-map/lincoln-hall/>. Additional images of Lincoln Hall.